Since the Alaska deployment began in 2014, stakeholders have come to recognize USArray's unprecedented capabilities. In parts of the state that previously had no monitoring capability at all, USArray stations now collect seismic, meteorological, infrasound, and soil temperature data. The $45 million facility is operated by the nonprofit university consortium IRIS under funding from the National Science Foundation. The project will end in 2019, after which IRIS will decommission the network and associated data products. 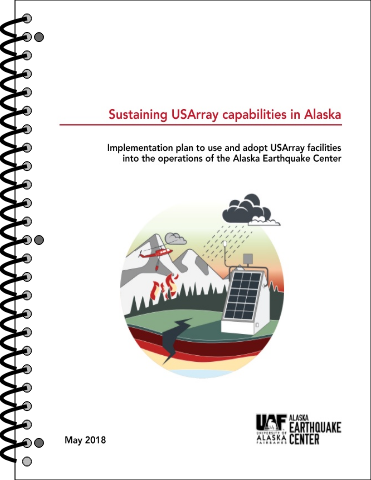 Sustaining USArray Capabilities in Alaska examines “adopting” stations from the array into the existing seismic network operated by the Alaska Earthquake Center. The document's implementation plan was developed in response to years of stakeholder efforts, including the two-day workshop on longterm USArray sustainability hosted by the Arctic Research Consortium of the United States in November, 2016. The objectives of USArray adoption vary considerably in different regions of Alaska, as do costs and logistics. Thus, the implementation plan divides the state into three regions, each with its own set of priorities (Figure 1). The origin and goals of this plan are laid out in the introduction of the Sustaining USArray document. At minimum, please take a moment to read these. The document also includes a high-level budget summary and information about data management, products, and logistics.